Like a lot of people, I love me some spaghetti (so much so that I’m willing to sacrifice talking like a grown-up). But like a lot of people, if I find myself eating too much of it, I have to wear the things in my wardrobe that are “blousy” or empire-lined. 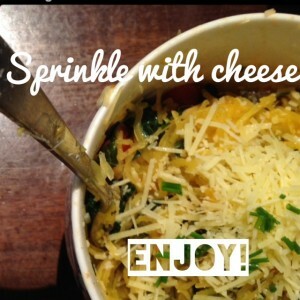 I don’t just like pasta for the carb-o-wonderful wheatiliciousness of it. I love it since you can experiment with what you are putting with it, and it just seems to bring it together in a mass of cohesive yum. Luckily, thanks to my father, I found a solution to this: spaghetti squash. 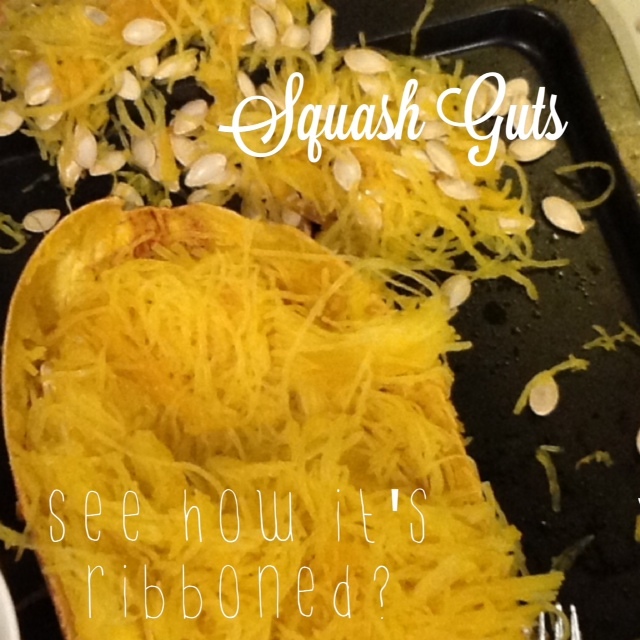 Now, what is spaghetti squash? You may be asking. Surely it must just be some wanky name coined by everyone who now refers to themselves as a (quelle horreur!) foodie? 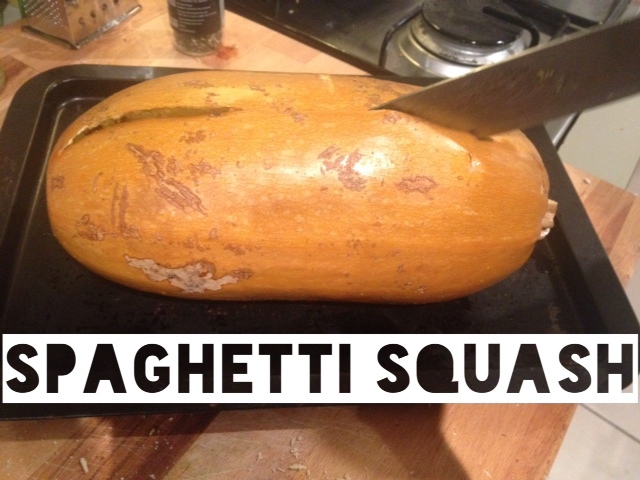 But no, spaghetti squash is a large winter squash (think more of a pale-yellowish-orange oblong shaped pumpkin, rather than the small circular Big Bird coloured squash you’re likely more familiar with) that when cooked, the insides fall out in ribbons. I’ve found that it’s best to roast the Spaghetti Squash whole because it doesn’t dry it out (as slicing it in half may do) and it gives it more of a consistent cook than boiling (part of it will always rise above the water). This will vary on how large your squash is, but is generally around an hour. Use a similar method to cooking pumpkin and gently prod the skin with your knife when you think it’s ready — if it sails through without resistance, it’s ready. If you cut it lengthwise, you will get these gorgeous long strands. The strands will be similar (or a little bit thicker) to Angelhair Pasta – this can’t be changed. 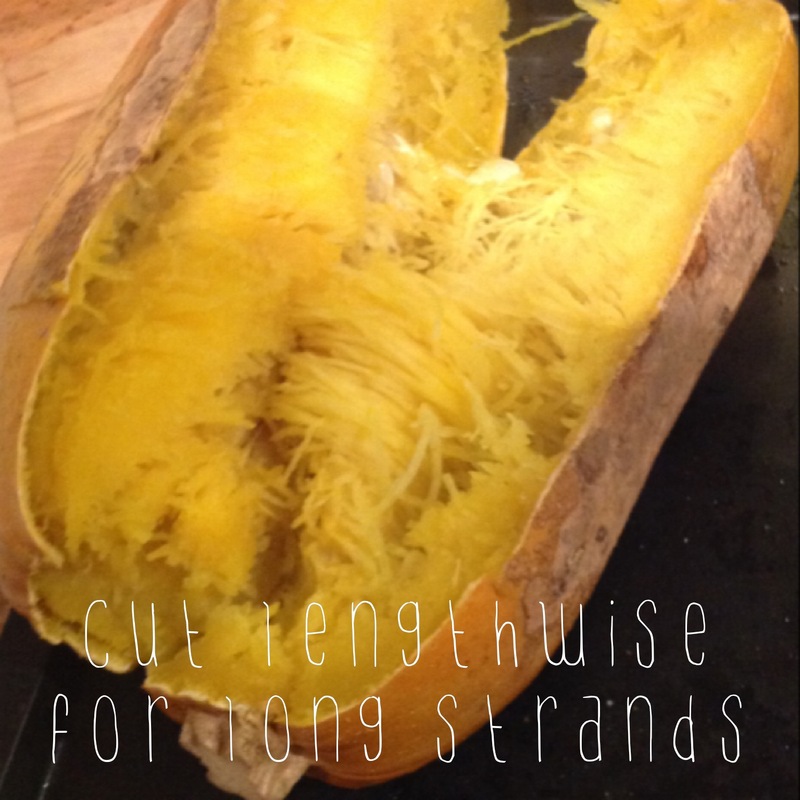 If you want smaller strands you can cut it across, but please note that this will make them very short and stumpy. And who wants stumpy pasta?! You get to rip out the squash guts! This isn’t as clean to do as, say, a pumpkin, so there will be some causalities. I haven’t tried it yet, but I’m tempted to try and roast the seeds along with their intertwined squash guts with some cumin and paprika and see if it results in delicious crunchy goodness. You can then get out the “pasta” – it’s good to do this with a fork as it separates easiest, and it can be quite hot, so it’s an idea to work on what you would like with it. Just like with traditional pasta, you can really experiment. 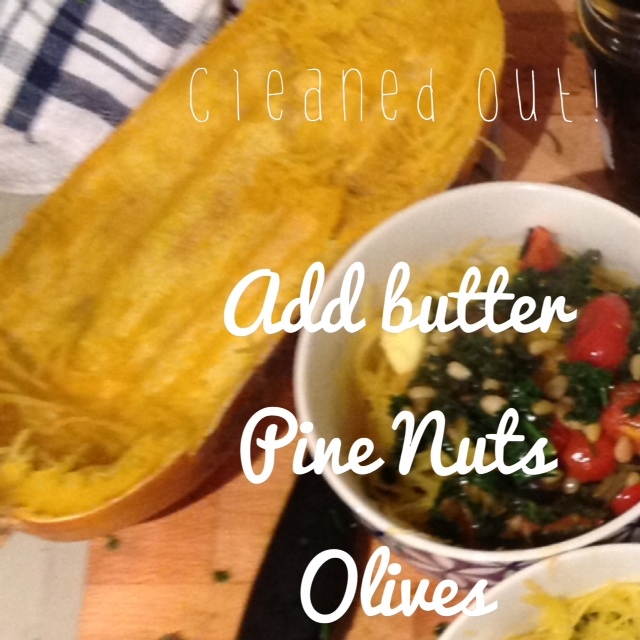 But since the squash as a lighter taste than pasta, I would stick with adding things that are still quite light. The butter is mostly because I ran out of olive oil. So you can do that too but the strands, like pasta, can get stuck together in clumps, and adding a teaspoon of butter or olive oil will help to prevent this. You can take away my refined-carbs, but you cannot take away my cheese. I’m not going to tell you spaghetti squash is as good as pasta, or that you can’t tell a difference…because that would be so many lies. 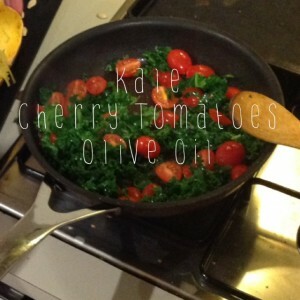 But I can tell you that it’s delicious in it’s own merit, it’s easy to make, and it’s nutritious to boot. And really, what’s not to love about that? Any idea where a Melbourne gal can get herself some spaghetti squash? This entry was posted in Food and tagged food, friday foodie, recipe. Bookmark the permalink.